The Font Awesome 5 icon set is huge, so in Settings > Beaver Builder > Icons there are several choices for subsets of Font Awesome 5, as shown in the following screenshot. Note: Prior to Beaver Builder 2.2.2, the older Font Awesome 4 icon set was available for selection, but Font Awesome 4 is not compatible with Font Awesome 5. As of Beaver Builder 2.2.2, the Font Awesome 4 icon set is no longer loaded. If you have Font Awesome 4 icons in your existing layouts, a shim is loaded to automatically convert them to Font Awesome 5 icons. You can enable or disable any of these built-in icon sets. You can also create your own icon sets and import them into Beaver Builder. See the Related Article for instructions. You can disable or delete any custom icon sets that you upload. This applies to both built-in and custom icon sets. On the WordPress admin panel, click Settings > Beaver Builder, then click the Icons tab. Select or clear checkboxes to enable or disable the icon sets. Go to Settings > Beaver Builder > Icons. Click Delete next to the icon set you want to delete. This removes the custom icon set from loading in Beaver Builder, but it doesn't remove it from the Media Library. 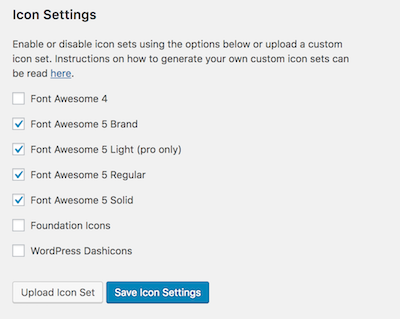 To delete the icon set in the WordPress Media Library, go to Media Library from the WordPress admin panel and delete the custom icon set zip file.